One of the biggest perks of living in Sycamore Terrace Apartments in Temecula is the strong sense of community you become part of, the moment you move in. Our folks love to celebrate important occasions together. This Halloween, we’re bringing the neighborhood together for some spooky fun with a Halloween Party and Amazing Dana the Magician! 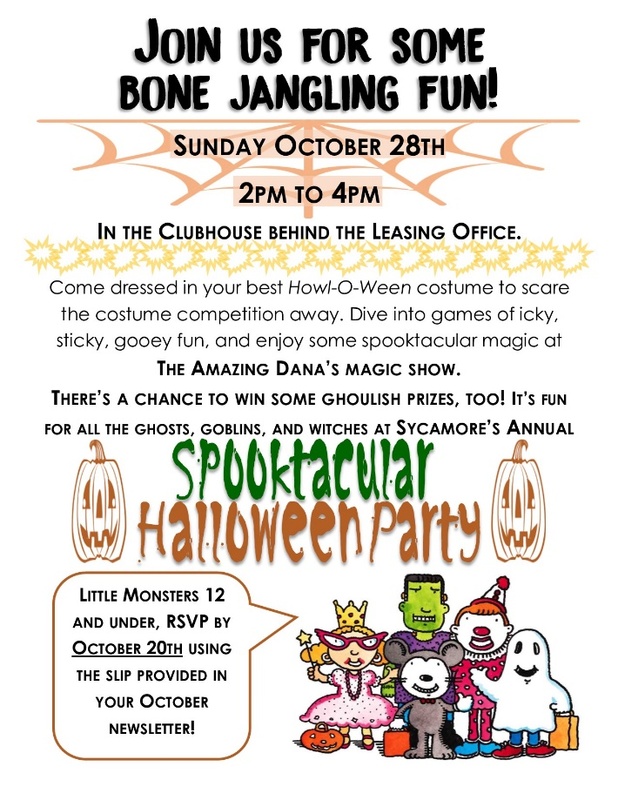 Drop by our clubhouse on Sunday, October 28, at from 2pm to 4pm to join this exciting event. If you’ve attended one of our Halloween parties before, then you’re certainly familiar with the Amazing Dana. Prepare to be dazzled by his magic tricks and antics again this Halloween! Now, what would Halloween be without dressing up in your best costume? We’re inviting our younger residents to participate in our Halloween costume contest. Be scary, be cute, be colorful, be creative— showcase your talents with your Halloween costume! The winner will receive a surprise award from Sycamore Terrace Apartments. Finally, all guests will take home goodie bags bursting with sweets and other treats! The best part? You’ll get to create new memories, make new friends, and bond with our folks right here at Sycamore Terrace Temecula! Of course, the fun doesn’t stop between big occasions. The beauty of living in our Temecula apartments is you get access to great amenities, so you never run out of things to do. We have volleyball, tennis, and basketball courts for our residents. Play with the whole family, or invite some of the neighbors for a friendly match and court action. Hot day? Take a dip in one of our two pools and spas! It’s maintained daily so it’s always sparkling and the water is heated to a perfect 70 degrees all year. Never pay for a gym membership again. Why would you, when you can work out at our Fitness Center anytime! Work up a sweat on your own or invite a workout buddy to make exercising more fun. Have a little picnic party right in the comfort of our apartment community. Our green lawn area is a wonderful place for a barbecue or just some outdoor bonding time with family and friends. Finally, never worry about a thing here at our cozy Sycamore Terrace Apartments in Temecula, CA. We have an on-site maintenance team that offers emergency maintenance services 24/7. For more assistance, we also have a courtesy patrol you can count on from 10 PM to 5 AM. It’s easy to enjoy everything Sycamore Terrace Apartments have to offer since you’ll have peace of mind every minute of the day. At Sycamore Terrace Apartments, we strive to make apartment living an amazing experience for everyone who calls us home. From beautiful, cozy apartments, to jam-packed amenities and great events, you’ll never want to live anywhere else!